The next morning we try to sleep in since the tide will not be low enough until midday, but our jet lag again plays tricks on us, we�re up at 7:00 am. By 11:00 we have already convinced Michael and Russ to get going although as they clearly indicated nothing will be out until later in the afternoon when the tide gets lower. They where right. No bears! We reached the end of the inlet and waited for the tide to get lower as we ate our lunch. We worked back up the inlet and as we reached George Creek we spotted a good black bear feeding on the beach. We stalked the bear by slowly walking up to him, and at 60 yards, I place my first shot in the basket but decide to take a second one as he runs toward the woods. The second shot hits him in the spine as he is falling backwards. He is a great black bear with a perfect hide and we decide to load him aboard and take him to the Estero for skinning. As we are nearing the Estero, we spot another black bear that seems larger than mine. Alvaro decides to take his 2nd bear. Russ and I watch the stalk from our boat. Alvaro takes him down with a great shot. 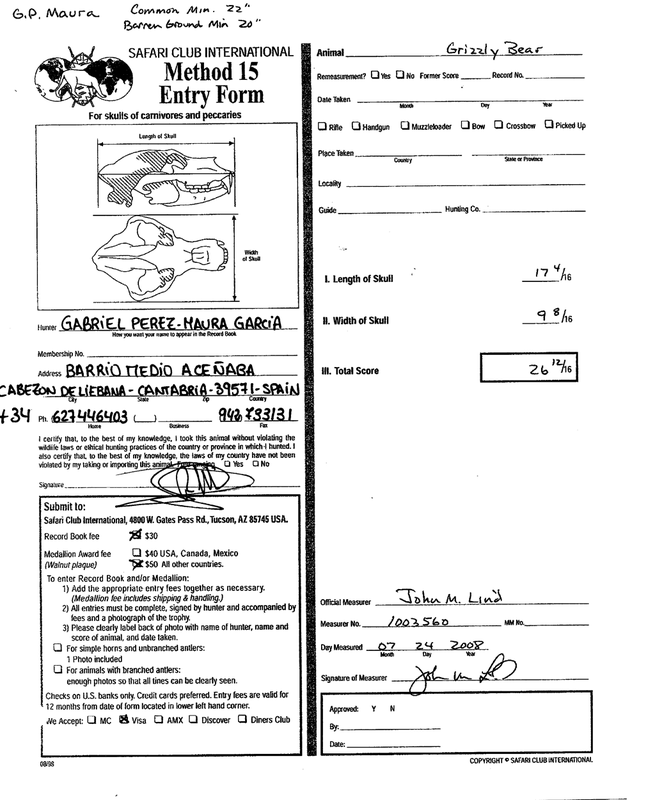 When we measure both hides and skulls we realize that Alvaro�s bear has a bigger hide squaring 6� 10� versus 6�6� measurement for mine. Mike said that when he was judging the bears with his binoculars, but since it is a younger bear it has the same skull length as mine but it is not as wide. 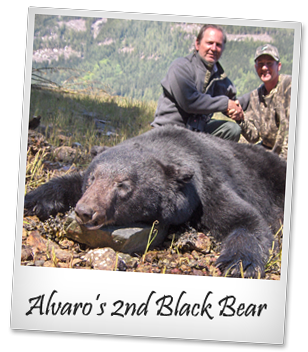 My black bear scored 19 2/16� and Alvaro�s was 18 12/16�. That afternoon we were both extremely happy with our success. We have hunted two grizzlies and three black bears in four days. 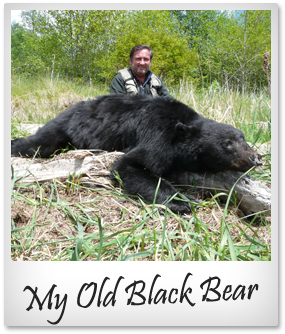 My grizzly clearly exceeded all the expectations a hunter could have when on a Canadian Grizzly hunt, Everything couldn�t have worked out better. Later, I decided that although I had another Black bear tag, I would only take one if we found a cinnamon black bear. We do not see any bears that day but I must say that it did not bother us . We have just had a wonderful hunting experience and it is just a great pleasure to be out there, away from our hectic day to day work. As we remember the first day with its worries and expectations, we now really feel the pleasure of having been on this superb B.C. bear hunt. We must thank Peter, Michael, Russ and Mike�s fianc�e Ellamir who looked wonderfully after us, for organizing a perfect week�s hunt where everything was more than right. After the long journey home some months went by and my hunting experience had joined the rank and file of many fond hunting memories. I hadn't given much further thought to the mammoth boar I was fortunate to harvest until I received a call from our outfitter, Peter Klaui of North Coast Adventures. It turns out that the final scoring was in and to my amazement my grizzly was the number one all time SCI Canadian Common Grizzly and number 13 all time North American Grizzly. 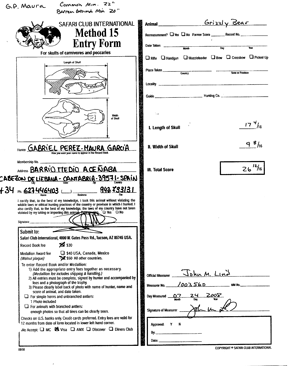 He is also the number one GOABC Mountain Hunter Record Book All Time Grizzly.